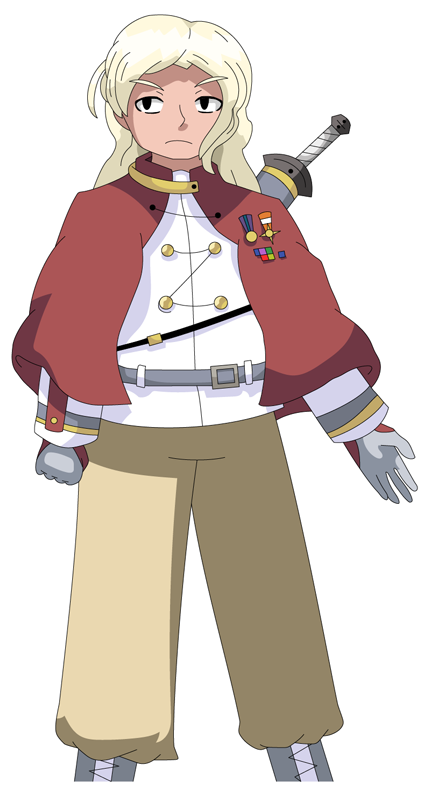 Kalda is a Lieutenant Colonel in the Ziorre Imperial Army, and an old friend and rival of Escarde and Yassir from training camp. A sword fighting prodigy and a friend of the Emperor's family, Kalda has very quickly ascended through the ranks of the army and now commands his own special battalion. He's friendly, but he's also smug and prone to trying to one-up those around him. Kalda is renowned for his prowess with a sword and can be a fierce opponent in combat. He commands numerous armored vehicles and ground troops that make Kalda a force to be reckoned with. On top of his physical skill, Kalda is a man of above average intelligence, and he's one of the most dangerous soldiers in the Imperial Army.